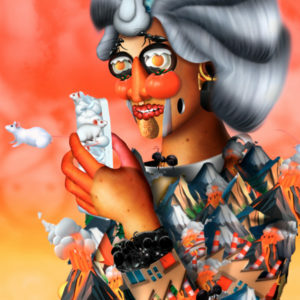 Portraits in Landscape is a video animation that exemplifies Gannis’s signature process of remixing historical artworks with contemporary forms of communication, taking smartphone and selfie culture to the extreme. 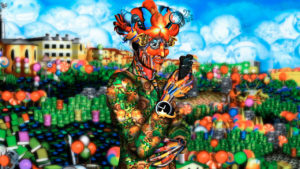 It depicts two separate figures in a twinkling landscape, each immersed in their smart phones and occasionally snapping photos. 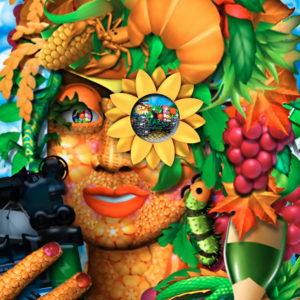 The piece is inspired by the sixteenth-century mannerist painter Giuseppe Arcimboldo, noted for his proto-surrealist portraits composited from images of animals, vegetables, flowers and books. Rather than static, organic objects, Gannis uses thousands of her own digitally painted emoji to compose her images. The work speaks to the hyper-real condition of inhabiting virtual and physical landscapes simultaneously, and its characters may seem uncannily familiar to viewers in Times Square where the work will be featured through August 31, 2018 in the Midnight Moment by Times Square Arts, the Public Art program of the Times Square Alliance. A partnership project with the Streaming Museum. Artist Talk: Saturday August 11th at 3 pm featuring artist Carla Gannis with composer Michael Lee and exhibition presenting partner Nina Colosi from the Streaming Museum. Michael Lee is an Interactive art student at Pratt Institute who works with visual and aural mediums. Lee has an interest in synthesizing new experiences through carving at virtual canvases and digital waveforms. Recently he’s participated in the FILE 2018 LED Show in São Paulo, Brazil as well as performed live visuals for Sean and Michael Lee of Livecode.NYC at Eyebeam, Babycastles and Secret Project Robot. He produced the soundtrack for artist Carla Gannis’ 3-channel video “Portraits in Landscape, Sunrise” which is now on exhibition at the Carl and Marilynn Thoma Foundation in Santa Fe, as part of “TRANSFER Download,” and on Governor’s Island as part of Harvestworks’ “Artworks and Experiences” exhibition. Huffington Post, “How One Artist Turned a Hieronymus Bosch Masterpiece into An Emoji Explosion” by Katherine Brooks, Dec 13. STREAMING MUSEUM brings a worldview into focus through the arts and its interconnections to contemporary international affairs and cultures, the sciences, technology, the future, and more. Since 2008 the museum has produced and presented exhibitions and programs that have reached millions on 7 continents in public spaces, at cultural and commercial centers, and StreamingMuseum.org, made possible with generous support from the J.M. Kaplan Fund and FJC Foundation, as well as many collaborators.